Curved timber walls and a bright internal material palette combine to create a dynamic learning space for Footscray West Primary School. The modular solution is sustainable and innovatively designed to include five teaching spaces, an arts space plus associated staff and student amenities. The building incorporates high-performing acoustic paneling and double-glazed windows, ensuring the learning environment is comfortable for the students. 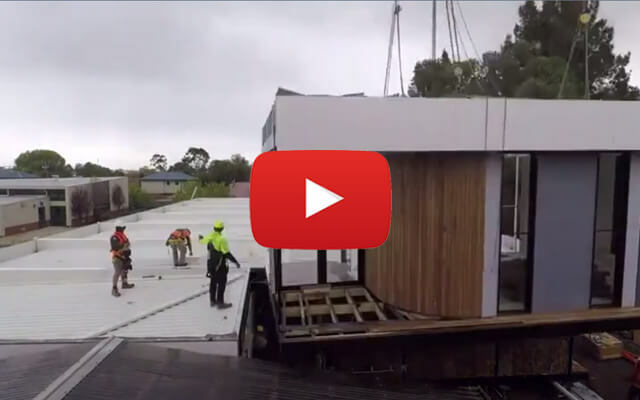 The new permanent modular building offered a fast and efficient solution for the school. With less time needed for planning and construction, the replacement of the older building containing asbestos could occur quickly, reducing disruption to students, staff and teaching programs. The construction was complete in just 16 weeks [check], off-site at Modscape’s modular construction hub in Brooklyn, with the modules being installed in a day over the weekend. Below is a video of the weekend install. Footscray West Primary School is an excellent example of modular construction technologies in education and another great partnership with Sensum Group and The Victorian School Building Authority. Videography and post production by Adam Patching Photography.